Located in Munich’s Old Town, the Cathedral Church of Our Lady was built in 1469 and has remained an unmistakable landmark ever since. 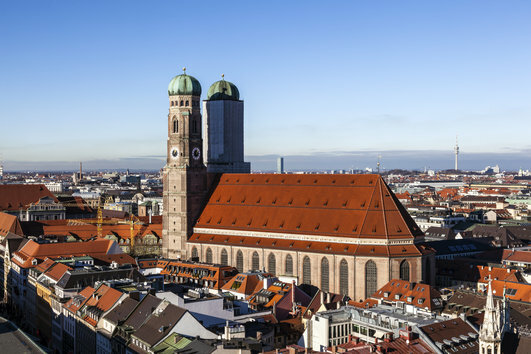 Known affectionately to the locals as Alter Peter (“Old Peter”), the Church of St. Peter is one of Munich’s greatest landmarks and the oldest parish church in the city. The church stands on a hill called Petersbergl overlooking the city and offers a beautiful, panoramic view of Munich…if you are willing to climb the 299 steps and pay a small entrance fee for the observation deck. Trust us; it is well worth the effort and extra money. Summer Hours: Monday through Friday: 9:00 am to 6:30 pm. Saturday, Sunday and holidays: 10:00 am to 6:30 pm. Winter Hours: Monday through Friday: 9:00 am to 5:30 pm. Saturday, Sunday and holidays: 10:00 am to 5:30 pm. Located in Munich’s Old Town, the Cathedral Church of Our Lady was built in 1469 and has remained an unmistakable landmark ever since. Constructed from red brick in the late Gothic style, it is interesting to note that the cathedral’s two towers are not actually the same height. The north tower is 98.57 meters tall (323.4 feet) while the south tower is only 98.45 meters (323.0 feet). Still, despite its slightly shorter stature, the Frauenkirche’s south tower offers visitors a beautiful view of the city and the Alps. The cathedral can hold approximately 20,000 people. Hours: Monday through Wednesday, Saturday, and Sunday: 7:00am to 7:00 pm. Thursday: 7:00 am to 8:30 pm. Friday: 7:00 am to 6:00 pm. Do you suddenly have a desire to explore the beautiful architecture of Europe? Just contact AESU, the most trusted name in travel. Planning a Trip to Munich Anytime Soon? Call AESU! This entry was posted on Thursday, June 4th, 2015	at 5:24 pm	. You can follow any responses to this entry through the RSS 2.0	feed. Both comments and pings are currently closed.